Now that I confined myself to my sofa for some “i’m sick but need to do some home office”, wrapped in my blanket and sipping tea I thought I could also do the weekly Yarn along post now, joining Ginny at Small Things where all the other people share their link too.. Last week, as I showed you, was Carnival and by the way I added a picture with me actually wearing my costume. But with all the partying I couldn’t be bothered to post anything else. But I did knit though. Between the parties and with friday and monday off I got quite a bit done. 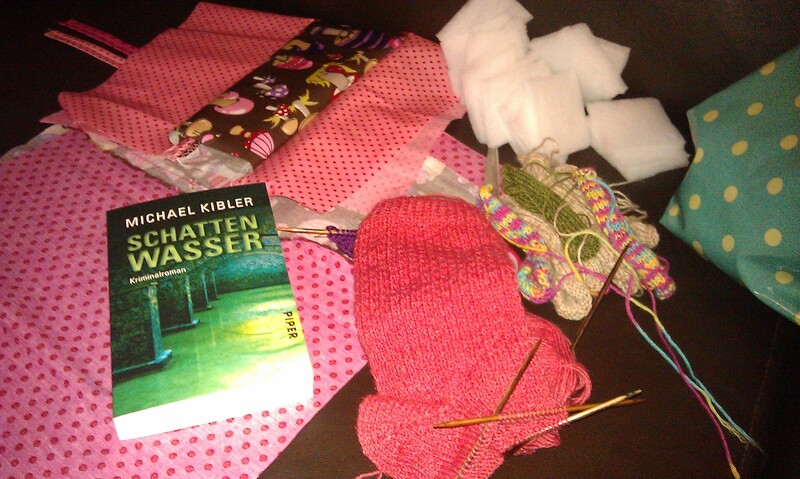 But as you can see, this is the mess that piles up on our sofa: a half finished first sock for a pair of Hermione’s Everyday Socks in a gorgeous colour that reminds me of strawberry sorbet, a couple of my kind of hexipuff that need to be sewed together and on the left half joined material for three little sports bags for Michael’s nieces who we are going to visit next week. Missing is my cardigan but hopefully next week I can show you more of it. The only thing I placed there just for the picture is my new book. I put Games of Thrones No. 4 aside and went for something else instead. Having read Engelsblut some weeks ago, I realised that I had read the first three books in the series and then the sixth. So with my Amazon voucher that I got from my colleagues for my birthday, I got the missing two. I like this series not only because the crime stories are set in my hometown but also because here the detectives have a private life that is important for the story. I crime stories like that better because a private life makes the characters far more realistic. This is also why I enjoy Donna Leon’s Brunetti stories so much. This entry was posted in Knitting & Crocheting and tagged Hexipuffs, Knitting, sewing, Socks, Sports Bag, Yarn Along by kathatravelling. Bookmark the permalink. Thanks. It think it a fresh colour, a bit girly but not too much. Love the colour of your sock. I want to knit socks with that pattern too it looks great. Love your projects, nice and colourful!